Three local projects are among the nominees for the 2012 Golden Hammer Awards. Up for consideration are 2010 East Main Street (above) under Urban Infill, and both 1435 North 32nd Street and 2621-2623 Q Street for Residential Renovation. Check out photos of all of the nominations here. The folks at Better Housing Coalition are looking forward to recognizing the nominees and winners on November 8 at the Hotel John Marshall with a Hollywood-style, red carpet affair and after-party featuring dinner and live music. Tom Silvestri, publisher of the Richmond Times-Dispatch, will serve as master of ceremonies. The Better Housing Coalition will also honor Susan Dewey, executive director of the Virginia Housing and Development Authority, as its Groundbreaker for 2012 at the ceremony. Tickets are $100 each and are available at betterhousingcoalition.org/groundbreakers. For some reason 2102-2104 E Broad didn’t get nominated. WTF? To give the devil his due, I actually do like Johannas’ rubik’s cube building in Shockoe (pictured). At least I think it’s one of his… It’s all about context. That thing would be hideous in Church Hill but it fits nicely in that area. Is this the same building as in the picture? Alex #2, the rendering in your link is the same building as in the photo above, but the completed building is not exactly like the rendering. I can’t stand it myself, but I have to admit that the photo above makes it look okay. It’s the view coming down 21st Street that is so ugly for me, and I don’t like the way it wraps around and overpowers the little Jewish cemetery on Franklin St, either. I am thankful that the hideous 2102-04 Broad St. stuff didn’t make it into the nominations. Thanks for the clarification. I thought it looked like that location so I assumed it was just a revision of the same design. A lot of similar elements between the two designs. So I guess my favorite Johannas Design project wasn’t one of theirs after all. His style is perfect for that area though. 2010 East Main St. (top picture) is an abomination, even for “Infill.” It’s hideous and poorly constructed and is a blight on the area. We watched as the structure was (creepingly) constructed and the materials could not have been crappier. Untreated wood would stand up the the elements for weeks waiting for construction to continue. It’s a very unfortunate addition to the Bottom. To be fair, the Q Street one looks great. But the Main Street one… You must be kidding. This 3rd World Country building block fiasco wins for what reasoning to fit into a Historic area???? We get it, you don’t like modern design. You should try to expand your horizons, you might be a happier person (on the internets, anyway). I like how this building looks. It’s a much more forward looking design than any of the fake bricky new buildings put up in the area. It’s sense of being of NOW suits a city that is moving forward. This reminds me of apartment buildings in cities in Europe. I also like how it “uses”. I like how it includes street level office/retail, retaining the use patterns of the city that we all appreciate. I like how it’s scale beings hundreds of new residents to the area. I like how it takes the place of an empty parking lot. I have said it before, I am all for progress and even modern buildings but just not in a Historic area. Elsewhere in Richmond is fine. Closer to Downtown or moving towards Midtown or West End. There should be a boundary set that says NO modern buildings are allowed within it like the French Quarter in New Orleans. Anything goes outside that boundary. How many times have we seen modern buildings such as chrome and glass high-rises that were never built. I know of one that was supposed to be there now across from the State library on Broad but what happened? I was all for it but we were given a bill of sale that it was to be built “immediately” after the old department stores were demolished. And it would have been fine where it was to be. Now the city has one last opportunity with the old Reynolds foil plant on 10th and Byrd that a high-rise was proposed and have yet to see anything moving forward with that. Will be hard now that they have converted attached buildings. I have to make a public apology here after learning who did the double house above. Years ago I pretty much blasted Tom O’Kelly of Jewels General Contractors over some work done on a wall at 401 N 27th Street. 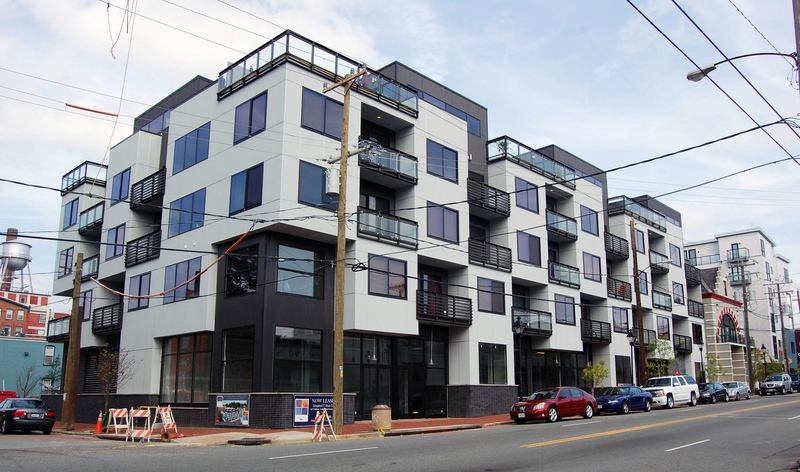 But now seeing the work he and his company did on 2621-2623 Q Street, that is stellar and should be commended. He would get my vote for Residential Renovations. This is the kind of work I want to see preserving Church Hill! Now I wish he would reconsider 401 N 27th !!! If interested, I have an artist rendering of how it looked in 1815 ?